Prior to the Apollo age, geologists did not believe that continental drift was possible. 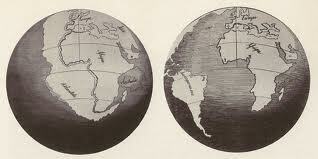 It was generally assumed that the continents were fixed. It was thought, however, that the continents could move up and down, just not laterally. As the Apollo program began to ramp up, geologist were just coming to terms with the idea of sea floor spreading and mobile continents. The discovery of the mid ocean ridge system provided the long sought “mechanism” for continental motion. Alfred Wegener had proposed many years earlier, that the continents had all once been gathered together into a single giant landmass. He dubbed this ancient continent Pangea. He “reassembled” the continental puzzle, noticing distant places around the globe that had similar geology and may have once been connected. He studied the distribution of glacial deposits, animal and plant fossils, and geologic formations. This evidence, which today is found separated on opposite sides of the oceans, Wegener felt could be pieced back together as proof of an ancient Pangean continent. This single great continent of Pangaea, Wegener proposed, was eventually torn apart. The mechanism of this dramatic event wasn’t known at the time, but Wegener speculated that it could have had something to do with the gravity of the moon. The explosive force that sent the modern continents spreading around the globe we now know was plate tectonics. But the moon may very well have had something to do with the recharging of Earth’s battery and the initiating of plate tectonics. However, at the time, lack of a known source of energy to power this continental explosion prevented the widespread acceptance of Wegener’s continental drift model. These new modern continents radiated around the globe producing new mountain chains, altering ocean currents and creating new climatic niches. Typically today the beginning of the breakup of Pangea is placed somewhere around the Permian-Triassic boundary. The standard scientific belief is that the rate of plate spreading is generally constant. This is based on the assumption that the heat of accretion (heat from the original formation of the earth) is the only source of heat to run the tectonic system. However, the earth’s original measure of tectonic heat is slowly waning and therefore plate tectonics should also be slowing through time. It is assumed that there is no process able to add to the original energy budget of earth. Therefore any uptick in plate activity must have an explanation. The rate or speed of plate motion is found by observing the distances between known geologic features on opposite sides of a mid-ocean ridge. The distance between similar geologic formations found both in Africa and South America for example, can be divided by the accepted geologic age of the beginning of continental separation. This calculation provides generally accepted rates of continental spreading that are about 2″ per year. The problem with this modern spreading rate is that it leads to estimations of the breakup of Pangea at the Permian Triassic Boundary. At 2” a year it simply takes that long for the continents to be at their current distance. This is because the modern rate of spreading is assumed to remain relatively steady back through geologic time. The fossil evidence, however, suggests a more recent separation. The geologic and fossil evidence are in conflict over the time of Pangea breakup. More recent evidence shows a break-up at the end of the Triassic (closer to the Triassic-Jurassic Boundary). Conversely, the Close Approach Lunar Model hypothesizes that the initial continental drift, which began with the disruption of Pangaea and was fueled by the close approach of the moon, started rather suddenly and later than is commonly assumed. Once continental drift started, it increased in pace until achieving a maximum during the Jurassic/Cretaceous period and has since slackened to the pace we see today. This is all made possible by the introduction of a new source of heat, the tidal dissipation of heat of a closer moon. This has significance in regards to precise dating of species separated on different continents. Fossil evidence found on both sides of the mid ocean ridge can appear to be very similar. And, of course, it was this observation that led Wegener to propose his mobile continent model. The standard scientific model of Wegener’s day, which was being used to explain this similarity of species, was the “land bridge”. The anti-mobilists camp, which included nearly all scientists of the day, believed that the continents were fixed but could rise and fall. 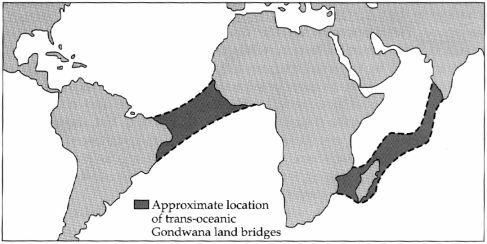 Therefore it was believed that great ocean-spanning land bridges would rise out of the ocean, allowing plants and animals to migrate across the ocean. This was the only means of explaining similar populations on opposite sides of the ocean. The new timescale, of the CALM, allows for a shorter actual time of separation between related species, which were divided into two distinct populations by the opening of seaways and spreading of continents. 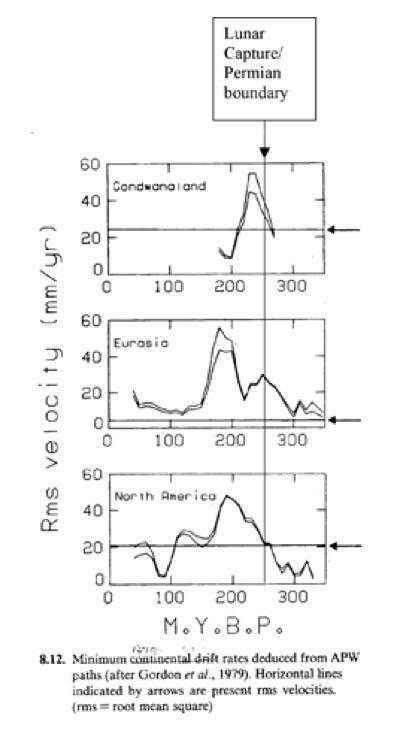 A rapid break up of the landmasses with eventual slowing to today’s observed rates, allows for better correlation with the actual observed duration of time in which animals evolved independently of their ancestors upon the resulting continents. “The world was changing of that there could be little doubt. The end of the Triassic very probably marks the beginning of the end of Gondwanaland and Laurasia, with the inauguration of physical changes of overwhelming importance that were to determine the evolutionary directions that would take place among the Earth’s living inhabitants.” Colbert, (1973) Wandering Lands and Animal. E.P. Dutton and Company, Inc., NY. pg 142.